Mass Effect: Andromeda (game, 2017). An action role-playing video game by Electronic Arts. Official Trailer. Mass Effect: Andromeda is an action role-playing video game by Electronic Arts. 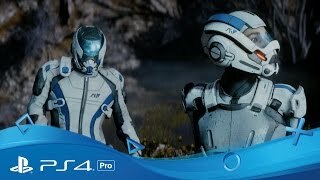 Mass Effect: Andromeda | Official 4K Gameplay Trailer | PS4 Pro. Mass Effect: Andromeda begins in 2185, between the events of Mass Effect 2 and Mass Effect 3. The four Citadel Council races and the Quarians are planning to populate new home worlds in the Andromeda Galaxy as part of a strategy called the Andromeda Initiative. Each race sends 20,000 citizens on a one-way, 600-year journey to Andromeda aboard their own transportation vessel, called an Ark, and selects a leader, known as a Pathfinder. Once the races arrive, they help build the Nexus, a space station that serves as a center of government and diplomacy, a living area, as well as a base of operations for the Pathfinders. Characters and player decisions from the original Mass Effect trilogy are not carried over into Mass Effect: Andromeda, and there is no canon ending which is referenced. The protagonist of Mass Effect: Andromeda is, depending on player choice, either Scott or Sara Ryder (voiced by Tom Taylorson or Fryda Wolff, respectively). Their father, Alec Ryder (Clancy Brown), is humanity's Pathfinder, tasked with finding a new home for the species. Squadmates in the game include Alec's second-in-command, Cora Harper (Jules de Jongh), a biotic specialist with intensive commando training; Liam Kosta (Gary Carr), a security expert who specializes in crisis response; Pelessaria "Peebee" B'Sayle (Christine Lakin), an asari gunslinger capable of biotic destabilization; Nakmor Drack (Stanley Townsend), a veteran krogan warrior of the Nakmor clan specializing in close combat; Vetra Nyx (Danielle Rayne), a female turian mercenary who excels in shielding and protection; and Jaal Ama Darav (Nyasha Hatendi), a resistance fighter of the newly introduced angara race. Ryder's crewmates include Kallo Jath (Garett Ross), a salarian pilot; Suvi Anwar (Katy Townsend), a human science officer; Gil Brodie (Gethin Anthony), a human mechanic; Lexi T'Perro (Natalie Dormer), an asari medical doctor; and SAM (Alexia Traverse-Healy), an artificial intelligence that can communicate with all members of the team via implants. 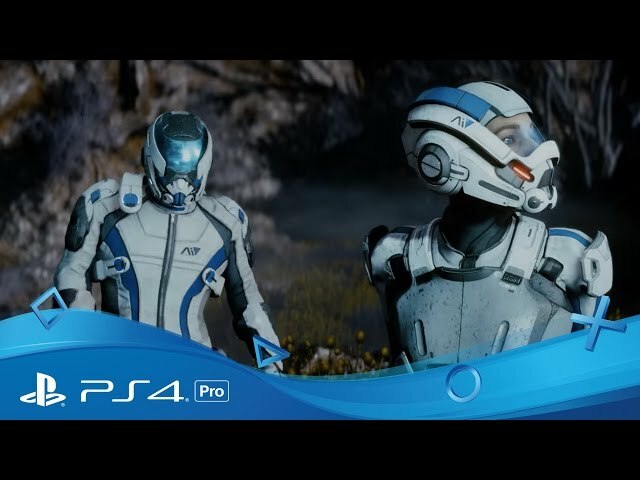 Mass Effect: Andromeda is an action role-playing game in which the player takes control of either Scott or Sara Ryder from a third-person perspective. Both Ryders' appearances and first names can be determined by the player. The appearance of their father, Alec, is automatically adjusted based on the appearance of the Ryder twins. Upon beating the game, a New Game+ is unlocked, which allows the player to restart the game with certain bonuses and switch to playing as the other Ryder, if desired. Players can also choose to continue playing with their existing character and complete unfinished missions. Mass Effect: Andromeda was scheduled to be released by Electronic Arts on March 21, 2017 (United States) and on March 23, 2017 (Europe).